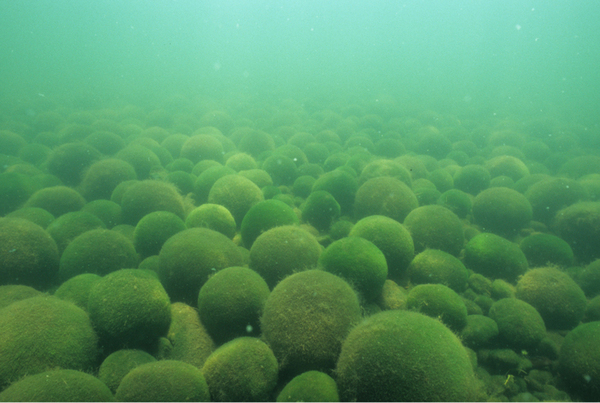 Among the most peculiar and scientifically interesting oddities of the Icelandic nature are the lake balls, or marimo. These balls are made up of filamentous green algae (Aegagropila Linnaei). This growth form of the algae is known from only two lakes in the world today; Lake Myvatn in Iceland (where it is called kúluskítur), and Lake Akan in Japan (where it is known as Marimo). Similar growth forms also appear in the UK, Germany, and several other Northern Hemisphere countries. 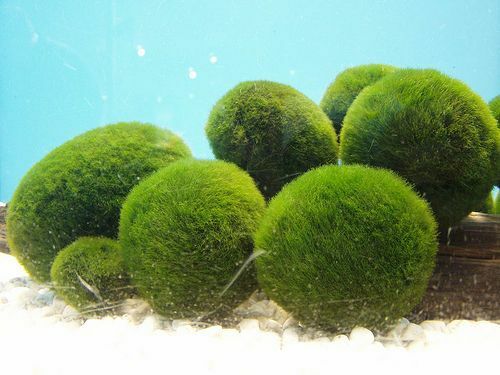 However, only in Lake Akan do marimo reach a perfectly round and formidable size and shape. Lake Akan is a highly protected area and the lake-balls are regarded as a national treasure. In both of the lakes, the lake-balls are only found in certain areas. The picture above was taken in Lake Myvatn by Dr. Isamu Wakana, a Japanise scientist and a marimo expert. Remnants from the Ice Age, Marimo used to be abundant in the Earth’s Northern Hemisphere. They can only exist in extremely clean, and cold water. They are unique in the algae family, because they possess cell walls and chitin– traits that are normally only present in plants, and thus, the distinction is blurred. Some scientists have even speculated that they could be what is left of an ancient bridge between algae and plants. The lake-balls in Lake Mývatn are approximately 10-12 cm in diameter. Due to their spherical form, which is almost unique among plants, the photosynthetic area is at minimum when compared to the mass of the algae. Usually all photosynthetic organisms tend to maximize this area (e.g. with large leaves or many pine needles) in order to capture as much light as possible. 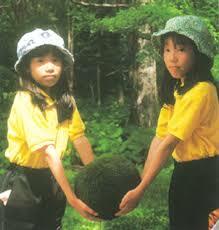 Lake Akan is home to Marimo often reaching the size of 20 cm – 30 cm, the largest known marimo in the world. The structure of the lake-balls is unique. There is no core (e.g. pebble) in the center. The algal filaments grow in all directions from the center of the ball, continuously branching and thereby laying the foundation for the spherical form. Surprisingly, the ball is green all through, although light only reaches a very short distance (few mm) into the ball (take a plant from your window, put it in total darkness for ten days and see what happens). The chlorophyll inside the ball seems to be in some kind of hibernation in the dark, but if it becomes exposed to light e.g. if a ball breaks up, it is activated again. This phenomenon may be unique to the lake-balls among photosynthetic organisms. Very little is known about the live-cycle of the balls. In Lake Myvatn, most of the balls are of the same size and “juveniles” are hardly found. That indicates that recruitment is either very slow or comes from outside the ball-areas. The age of the balls is also unknown, as there are no growth rings or other signs of annual growth. They are probably slow-growing and the age may be counted in years.